FROM CHARLESTON: Take I-526 to exit 19 (North Rhett Ave.). Go North on North Rhett Ave. for about 5.5 miles. Turn right onto Redbank Rd. (There will be a Burger King in front of you). Cross the railroad tracks onto Naval Weapons Station Charleston, but there's no security gate. 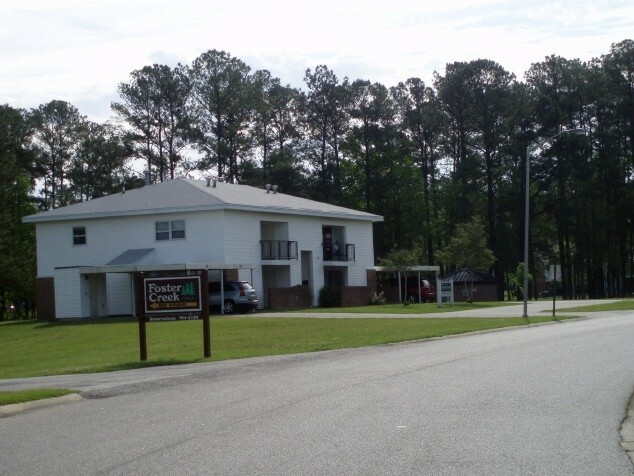 Past the NEX, turn left at the light onto Deke Giles Ave. At the stop sign, turn right onto Pulaski St. Drive 1 mile and the villas and RV Park will be on your left. ---- From I-26, take exit 205B (to Hwy 78 East). On Hwy 78, you will travel about 1.5 miles. Upon approaching Hwy 52, get in your left lane. At the fork, go left and cross over Hwy 52. At the second traffic light, turn right onto Redbank Rd. After traveling approximately 2 miles, you will cross the intersection with North Rhett Ave. Proceed forward. You will cross railroad tracks as you enter Naval Weapons Station Charleston, but there's no security gate. 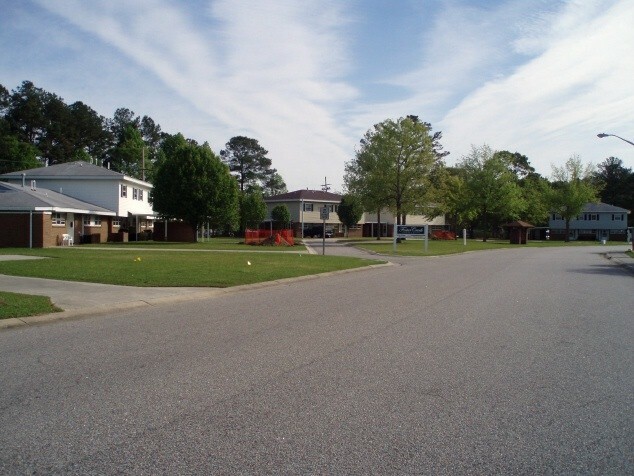 Past the NEX, turn left at the light onto Deke Giles St. At the stop sign, turn right onto Pulaski St. Drive 1 mile and the villas and RV Park will be on your left. Reservations are accepted 3 months in advance. CAUTION: Reservations must be paid in full in advance. There's no refund if cancelled less than 30 days in advance of arrival date. Free WiFi available, but is VERY restrictive on usage. Full use of WiFi requires a fee. 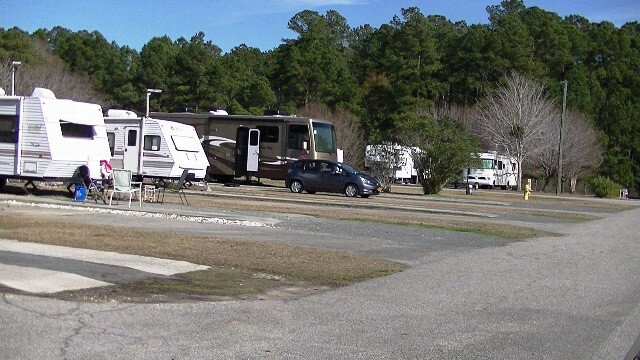 Allowed with usual leash and cleanup rules in the RV Park. Not allowed in the Villas. The maximum stay will be no more than one hundred and eighty (180) consecutive days. At the conclusion of this period, personnel will vacate the facility for a minimum of thirty (30) days. 3 washers and 3 dryers. No pull-thru sites. Maximum length - 70'. Villa rental rates vary based on type of accommodation. Four 2 bedroom (sleeps 4), ten 3 bedroom (sleeps 5) and two 4 bedroom (sleeps 7) rental villas available. This is the poorest excuse for a campground by far the worst I have stayed at. My site along with others turn into a swampy mud hole when it rains. 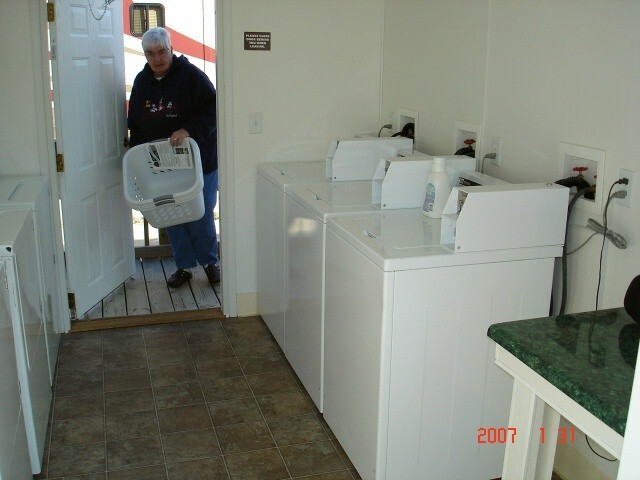 The bathroom / laundry room is virtually a closet with 3 washers & 3 dryers no room for 2 patrons at the same time. The deck out side this area is rotting and falling apart it needs to be condemned. The MWR Park Manager lives in the campground and her residence looks pretty run down as well. Either the manager does not care or is not capable or lacks the backing of MWR Officer. If you are looking for a nice place this is not it. In my opinion MWR is taking the profits from the campground and using them elsewhere it's obvious they are not reinvesting in the park. 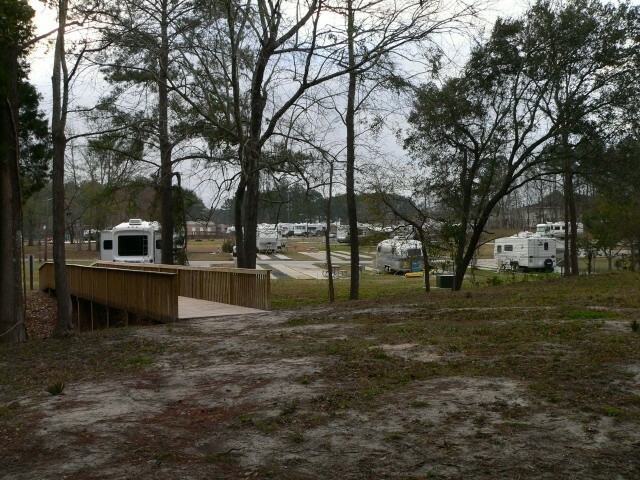 This is a poor excuse for a campground to date the worst I have stayed in. When it rains my site turned in to a swamp water and mud everywhere amoung several others. MWR Campground Manager lives in campground her place looks as run down as the rest of the park. Deck to bath room trailer which also contains a literally a closet with 3 washers 3 dryers no room for more than one person at a time back to the entrance this deck should be condemned if is literly falling a part and rotted. 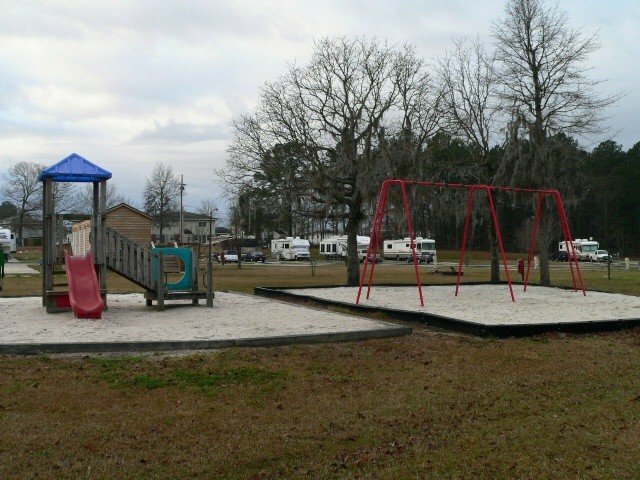 This place needs a person with management skills or MWR just doesn't care about maintaining the campground it appears they are using the revenue from the park for other things and not reinvesting it in the park. 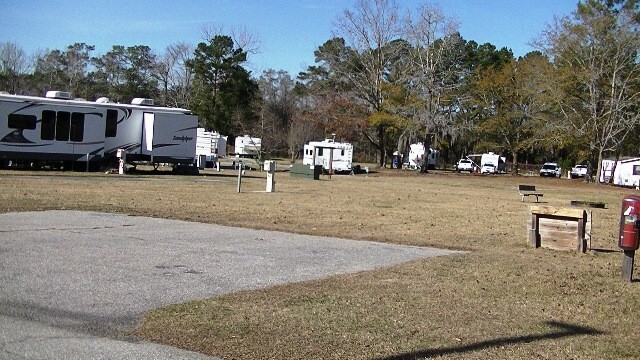 This place could be a nice campground with proper management!!! I stayed here on several extended stays. It's terrible as an RV park. Run-down, upkeep and cleaning is nearly non existent. It's ok if you're just looking for a place to park when traveling through the area or here for specific purpose such as visiting a loved one who is stationed here. It's not a destination that is close to any attractions. Closest cities, Goose Creek, North Charleston, nothing to see there and unattractive. Most attractions are at least 1/2 hr away depending on traffic, which is horrendous during commuting times. 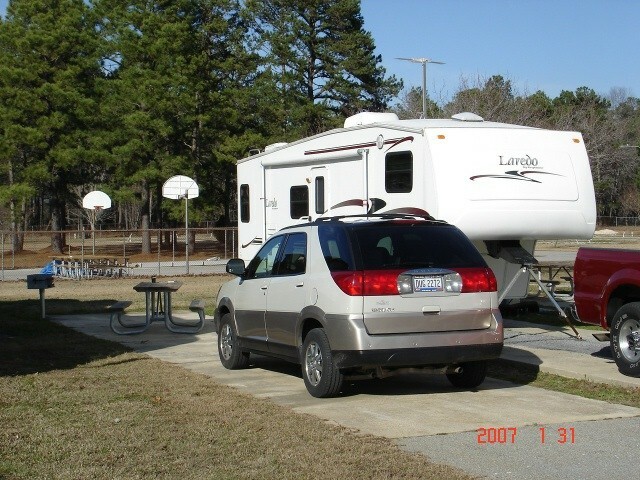 Oddly enough, the Air Force Base campground, 1/2 hr away, managed by the same upper management, is top notch! Go figure. On the plus side, except for major holidays, rarely full. The overall location is good. The park is in dire need of clean-up. The camp host is friendly but his site could use some clean up also. 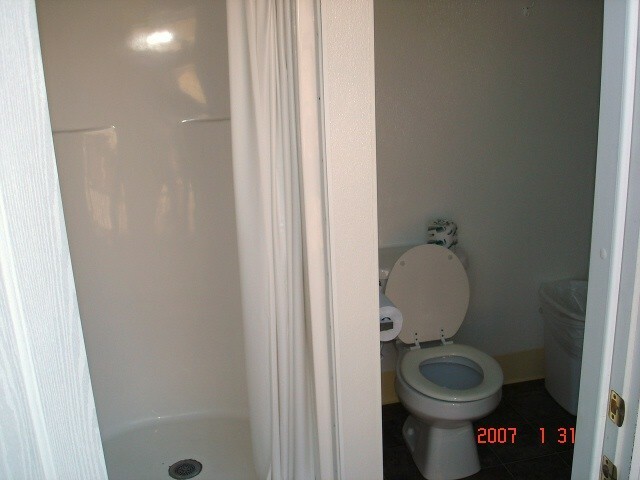 The bathrooms are pretty dirty and laundry facilities are in need of repair and a good cleaning. Wifi works well. Stayed on site 5, outstanding CG. The host does a great job very professional BZ No laundry ,awaiting new machines went outside to new laundry mat great base and location to Charleston .We will return again An excellent experience. I must say things must have improved since the last review in 2016. 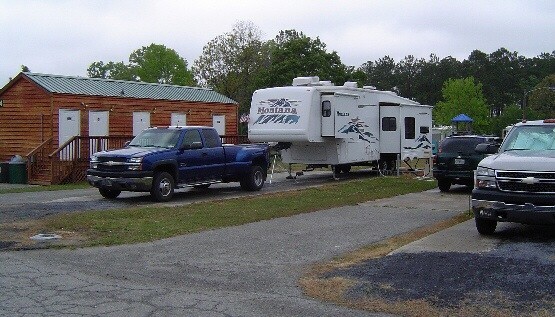 We stayed at Foster Creek in a 43ft 5th wheel. There was plenty of room and enough space between sites. Doc the host met us and was a great help. We especially appreciated Doc inviting us to the Friday night dinner at the local Fleet Reserve Association facility. About 20 folks from the park went and it was a great time. At $22 a night, the prices were very reasonable with Charleston being so close. And the Wifi was great. It wasn't overly fast but worked well enough for cruising the web. We didn't use the washrooms or laundry as we have our own. However we heard the washers were not working. The park is very clean but needs to be mowed more often. 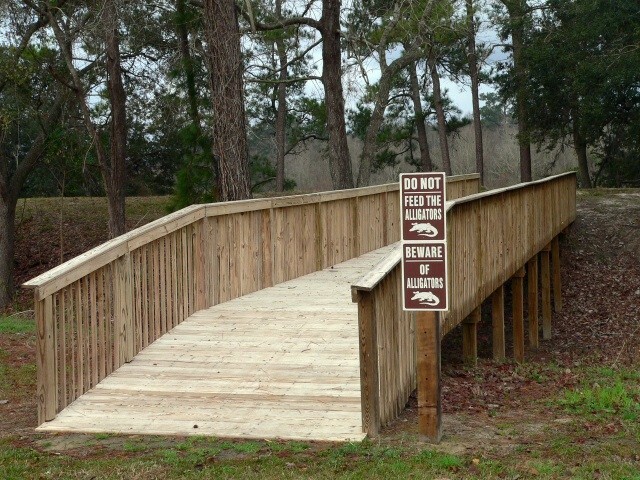 There's plenty pf space to walk your dogs too. We would definitely stay again next time we're in the area. Thanks Doc! 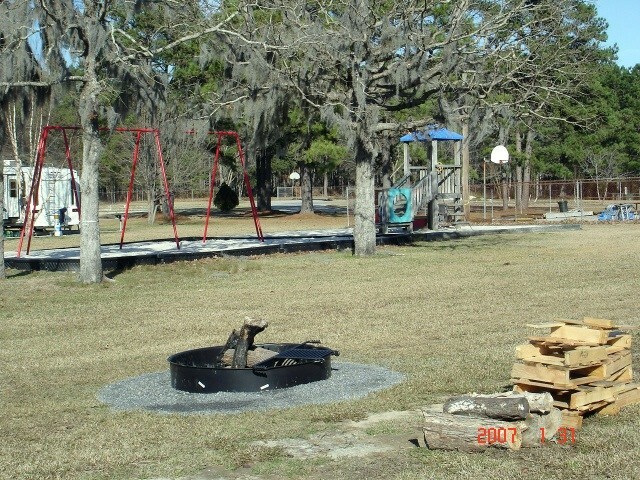 We stayed at the Foster Creek Villas with our kids while visiting the Charleston area. 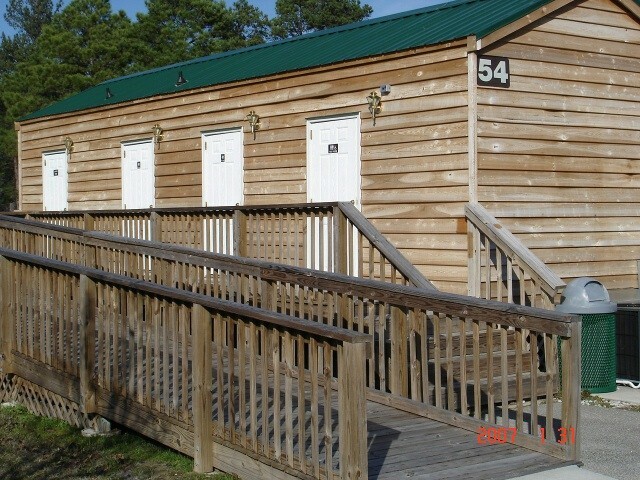 The rooms look like old base housing. They were spacious, but pretty run down. There's no housekeeping on a daily basis, but we did get complimentary coffee. There is laundry in the unit. No soaps or shampoos. We were there two nights and never could get Wi-Fi. Drove all over the base, but couldn't get it anywhere. That was frustrating mainly because there isn't any base guide or printouts to tell you what the hours are of things on site, like the comm and NEX. For the sites we visited, I used the data on my phone, but it's not unlimited, so didn't use that much. Be careful about your trash. Critters got into our trash can overnight and we had a mess to clean up. (It wasn't even our trash!) Good rates. We only paid $99 a night for a four bedroom unit. That's great for a big family. Easy access/No Gates. The NEX,commissary, gas station, and ITT are close by and easily accessible. Doc, the camp host was extremely knowledgeable of the area and great to work with. He greeted us when we arrived and answered our questions. Will Stay again! Definitely Recommend. Did not have cable, however was able to pickup several local channels with antenna. We requested a site good for satellite when we made the reservation several months ago. Upon arrival we discovered that the site assigned was not good for satellite and had trees that would scratch our slideouts when deployed. Person in the office moved us to another site-- even less likely for satellite. Manager said that the first she heard of the tree and satellite problems was from me-- and that was because no one had ever complained before. REALLY???? Issues: 1. Many of the transient sites have trees, i.e. no satellite use. 2. Many sites flood during rain- and remain flooded for days following rain. Several long-termers indicated that mosquitoes are menacing during summer because there often is standing water. 3. Fire ant hills are pervasive. Five on our site alone. Again, long-termers stated that they have been a problem for a long time. These pose a potentially deadly risk to anyone who is allergic. 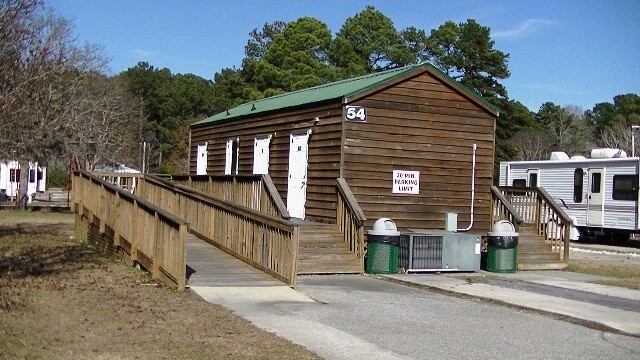 Overall, the most poorly maintained military campground we have stayed at in over eight years of full-timing. If we return to Charleston we will stay at a civilian campground instead of fighting the lack of maintenance, insects and water. Hopefully we won't have to wade to our car and dodge fire ants. 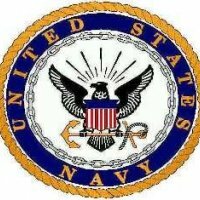 RECOMMENDATION: Someone in the chain of command should step up, get the SeaBees or others involved and install french drains at the campsites that flood. 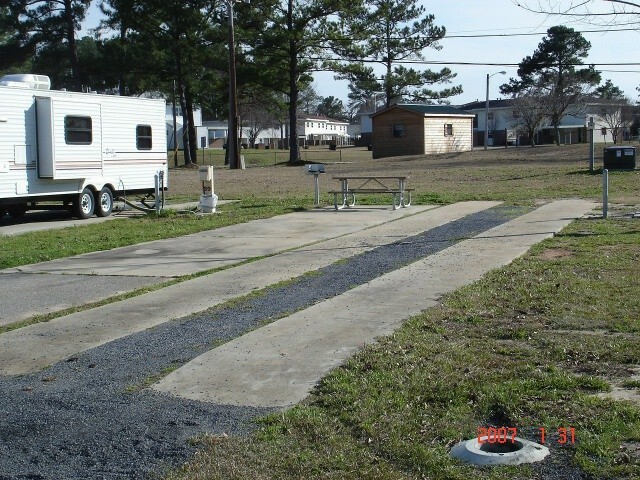 The command structure on the base should investigate the overall operation of this campground and take corrective actions as warranted. Our active-duty and retired personnel deserve better. Yes, most of the sites are long term, but getting reservations presented no problem. This is definitely big rig friendly. The sites are long enough to accommodate a 45' Class A with room in front for one or two vehicles. 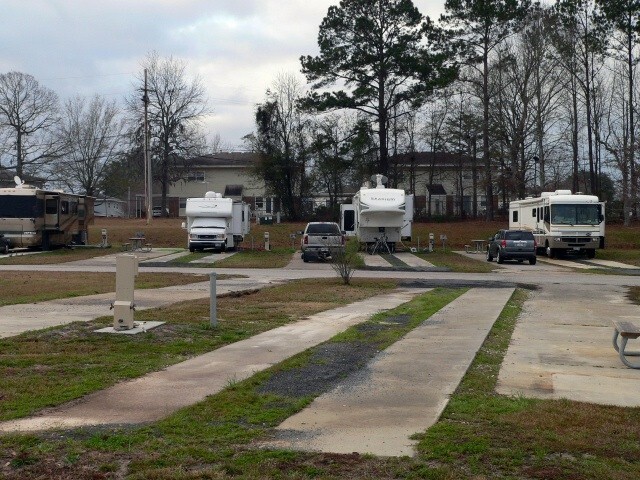 Amenities at the RV Park are minimal, but base exchange, commissary, gas station, pool, and everything else that you would expect to find on base are easily available. You do have to drive to them as they are spread out, but you don't have to go through a gate! Like everyone says, Doc, the camp host is the best. He was there as soon as we pulled in and made himself available for any questions that we might have. Foster Creek is about 20 miles from downtown Charleston, but the roads to I-26 and I-526 make it easy to get there for sightseeing. Go to the Charleston Visitor's Center, park there and take the free trolly transportation all over downtown. 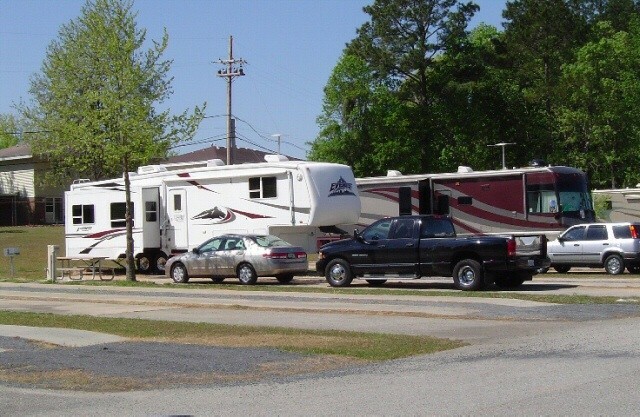 As an added benefit, Camping World is not too far away from the RV park, either.